On March 25, 2019, at least 3 assemblies took place in Minsk. All of them were peaceful ("the organizers shall have peaceful intentions and the assembly shall be non-violent", according to the OSCE Guidelining Principles on Freedom of Peaceful Assembly). The participants did not call for violent actions or war and did not use or provoke violence. The participants of the peaceful assemblies did not violate public order or traffic rules by their actions, nor did they pose a threat to public security and or violated other people`s rights and freedoms. During the peaceful assemblies, it was impossible to identify law enforcement officials because they were in plain clothes with no identification marks. The presence of police officers in plain clothes at peaceful assemblies does not allow participants to understand their functions and powers as well as it does not facilitate the communication and effective solution of complex or conflict situations and does not allow law enforcement agencies to provide their activities in a transparent and accountable way. There were no obstacles to the work of independent observers and mass-media, which seems to be a positive tendency. Moreover, the law enforcement officials have no comprehensive understanding of the functions and tasks of independent monitoring and have no information of possible presence of observers. The observers, in turn, have no information about whether a legal permission was issued to organize the peaceful assemblies on March 25 in Minsk. However, since the assemblies analyzed were limited in the number of participants, static and short in time, they did not require detailed coordination with the official authorities and law enforcement agencies. At the same time, prior notification of the authorities about the planned peaceful assembly is a good practice that promotes effective communication of all interested parties. The Human Rights Center “Viasna” reports about 15 detained persons in Minsk on March 25. Most of them were released from the District Department of Internal Affairs in the evening of the same day without charges. The National Human Rights Public Association “Belarusian Helsinki Committee” and the Human Rights Center "Viasna" systematicly monitor every peaceful assembly in Belarus on the basis of developed methodology. It includes: recruitment of observers and training them such skills as: the principles of public control, international standards of peaceful assembly and monitoring methodology; filling out the monitoring questionnaire during observation; processing of the questionnaires and writing a monitoring report. The questionnaires for the monitoring of peaceful assemblies are developed in the cooperation with human rights organizations. They includes such points as: the functions and powers of observers and journalists, the standards of conduct of organizers, participants and law enforcement officials during the assembly as well as the presence of the ambulances and medical rescue teams. Observers are allowed to monitor an event only if they agree with the monitoring rules and principles (such as: to be independent and politically neutral; to contain factual information, but not opinions; do not participate into observed event; to adhere to the principles of law: to reject any form of violence and discrimination; to behave correctly). During their terms as observers, people shall stay separately from the participants of the event. 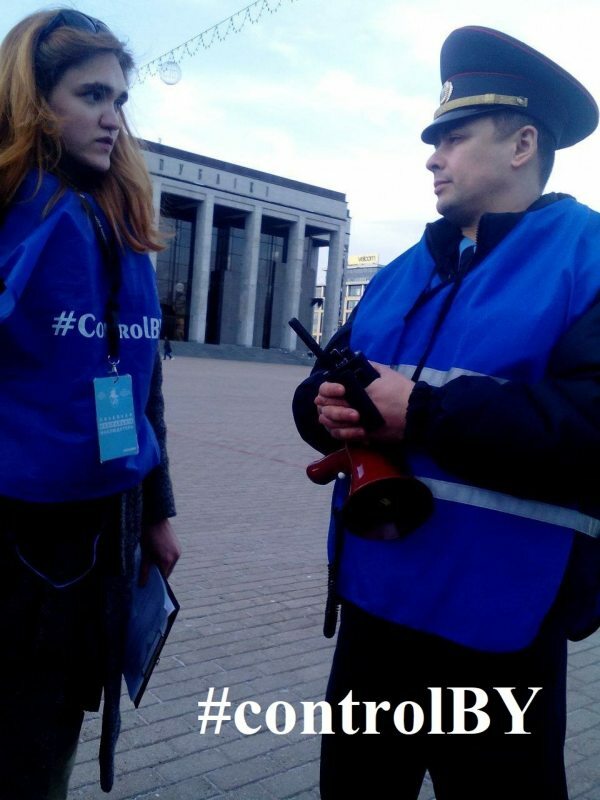 They are marked with certificates and wear special blue vests with the inscription "#Controlby". On March 25, Belarus celebrates the traditional holiday “Freedom Day” in honor of the anniversary of the proclamation of the Belarusian People's Republic. In 2017 and 2018, numerous repressions were recorded, including the detention of independent observers (https://spring96.org/ru/news/88343, https://spring96.org/ru/news/89526). This year holiday concerts took place in Grodno on March 23 and in Minsk on March 24. The organizers of the concert in Minsk publicly on social networks expressed a desire to march from Kastryčnickaja square on March 25 at 18:30 and to lay flowers near building number 9 on Volodarsky street where the BPR was proclaimed. During the peaceful assemblies, 6 properly trained and specially marked observers constantly carried out control over the implementation of human rights. Two of them represented the International Network of Observers (ION). They were marked with gray vests labled "Observer” and had special identification card. On March 21, a letter was sent by fax and e-mail to the Minsk City Police Department with information about the intention of observers to attend mass public events on March 24 and 25 in Minsk and about the importance of independent monitoring at peaceful assemblies. The letter also requested the staff to be informed of the presence of observers at the events to ensure their safety and to facilitate the work by providing the information by request. In the morning and throughout the day on March 25, in the social networks and media there was information about the presence of special police vehicles used to transfer suspects in the center of the city. Some of them were parked near Kastryčnickaja square and Yakuba Kolasa square. According to mass media reports, a priest of the Belarusian Autocephalous Orthodox Church (father Vikentsi) and activist A. Talstaya carried out an action at around 17:20 on Kastryčnickaja Talstaya chained herself to a post and held a poster with the inscription: "Freedom Day in Unfreedom. Freedom to the People!" Father Vikentsi had a white-red-white flag. They explained journalists that the event was dedicated to detentions that happened on March 24. The police officers in plain clothes checked their documents, broke the chain with the involvement of the agents of the Ministry of Emergency Situations and then escorted activists in a minibus with no identification marks. The total duration of the action was about 10 minutes. The detainees were taken to the Central District Department of Internal Affairs. Father Vikentsi was released in the evening after drawing up an arrest report. Talstaya was detained until the trial. According to the information available, the activist went on hunger strike as a protest. 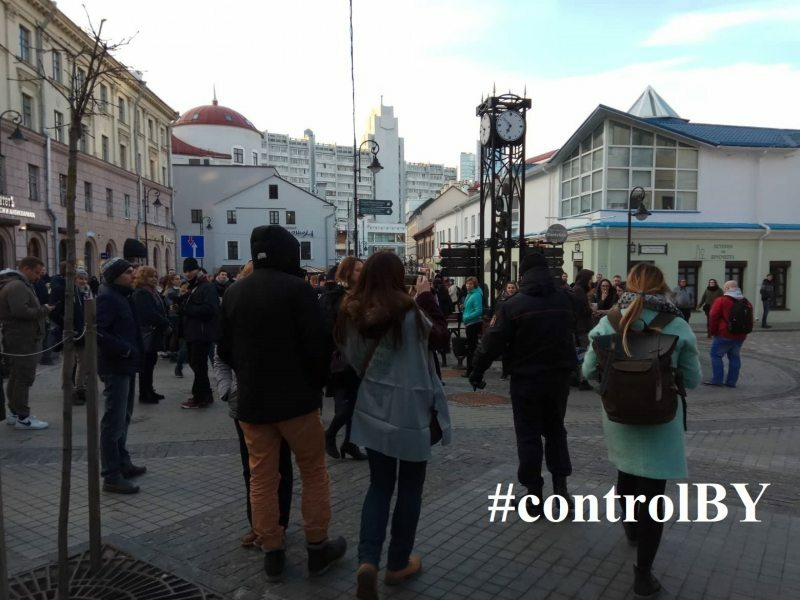 Independent observers were stopped by two law enforcement officers in plain clothes on the way to Kastryčnickaja square, near the house 25 on Independence Avenue at 18:15. The officer asked about the purpose on which observers were going to the area and whether they have a permission. After the consultation on the radio, observers were allowed to go to the place of the peaceful assembly and they were there from 18:20 to 18:45. 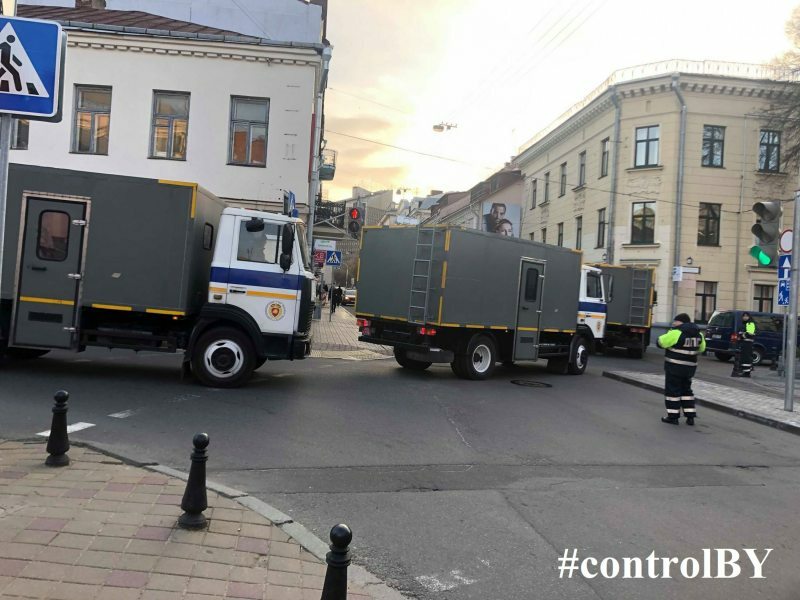 On Kastryčnickaja square there were at least 39 law enforcement officers in plain clothes, 4 special police vehicles for suspects, 2 minibuses, the police car and at least 18 journalists. At the nearest crossroads there were traffic police officers in uniform. Observers did not register the arrests directly at close range. 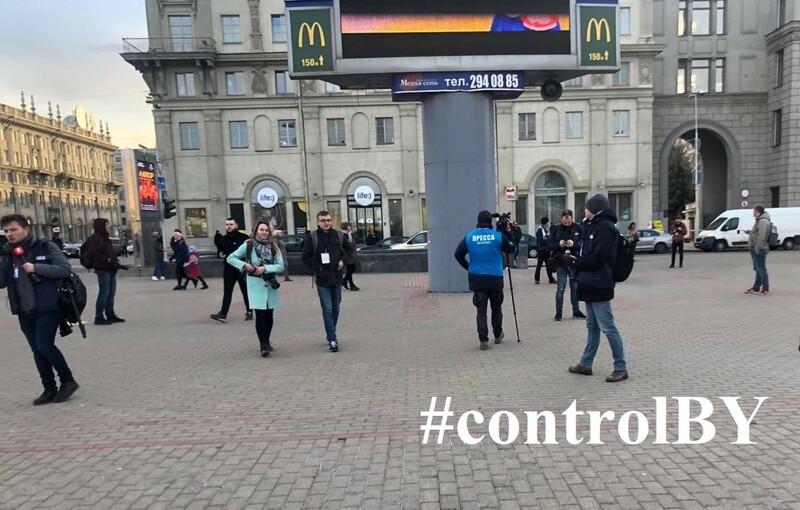 From videos and photos published in mass media and social networks, the following features of detentions on Oktyabrskaya square are visible: Everyone with flowers, symbols - such as white-red-white flags or ribbons - and the сoat of arms called "Pahonia" was detained. Nearby it was a minibus with no identification marks and with people wearing riot police (OMON) uniform inside. Catched by people in plain clothes, a person was quickly packed on the minibus and taken away. At the place there was a representative of the information groups of the Minsk City Police Department (in the blue vest, with a loudspeaker). He explained observers that at the moment there is no unauthorized mass events on the Kastryčnickaja square and then recommended the observers to look for the information on the next day in the press service of the Minsk City Police Department or from mass media. During the conversation the negotiations from the radio of law enforcement officers could be heared: "A man with a scarf is giving an interview. When journalists gone, we will take him." It should be noted that, according to the Guidelines, the monitoring of peaceful assemblies is an important source of independent information about the actions of all parties on the assembly. This information can be used in a variety of ways, including one as a basis for dialogue between the authorities, law enforcement agencies and civilian people. Monitoring reports help to assess the effectiveness of actual legislation and how the state fulfills its commitments to protect the freedom of peaceful assembly. March 25, the information that the well-known Belarusian musicians (Liavon Volski, Zmitsre Vaitsiushkevich, Pavel Arakelian and Ihar Varashkevich) are going to take a concert in Minsk city centre in a pedestrian street (Kamsamolskaja Street) appeared on the Internet. The beginning was announced at 18:30 and by this time at there were at least 60 people including journalists (data obtained from photos and videos posted on the Internet). According to the mass media reports, musicians were warned by police officers before the concert that this action will be regarded as an unauthorized mass event. Then musicians were detained by riot police officers and law enforcement officers in plain clothes (one of them had a body video recorder) and taken to a minibus with no identification marks. After the minibus drove away, people there started singing songs and clapping in rhythm. Independent observers were at the place of the peaceful assembly from 18:50. A police officer in uniform using a loudspeaker warned the audience that the event was not allowed by the authorities. He told about the possibility of prosecution for violating the law; also demanded to go away or otherwise physical force and special measures can be used against those assembled. The participants communicated with the media, continued to sing songs and use mottos: “Long Live Belarus” and “Shame”. At the assembly place there were at least 15 representatives of the mass media, at least 3 police officers in uniform and at least 11 officers in plain clothes including those with hand-held video registers. On the nearby streets there were such police vehicles as minibuses and special police vehicles for suspects. Around 19:15 people began to go away. At 19:25 at the place there were journalists and officials in plain clothes. It is known that the detained musicians were released in the evening on March 25 without drawing up protocols on violation of the law. to notify city authorities and/or law enforcement agencies about a planned peaceful assembly. do not detain organizers and participants during or after peaceful assemblies arbitrarily and unreasonably limiting their rights to the freedom of peaceful assembly. to initiate changes on the national legislation and bring it into line with international standards on freedom of assembly. to promote freedom of assembly in Belarus, not to establish excessive administrative procedures, to refrain from arbitrary restrictions on places of peaceful assemblies and not to demand payment for law enforcement, medical care and cleaning services. not to bring people to administrative responsibility for their participation in peaceful assemblies as this is an arbitrary restriction of the right to peaceful assembly provided for by the international commitments of the Republic of Belarus in the field of human rights.